Many people are drawn to motorcycles for the fun, adventurous driving experience, but safe motorcycle riding should be your top priority on the road. Luckily, there are many precautions you can take to stay as safe as possible while driving a motorcycle without sacrificing your fun in the process. 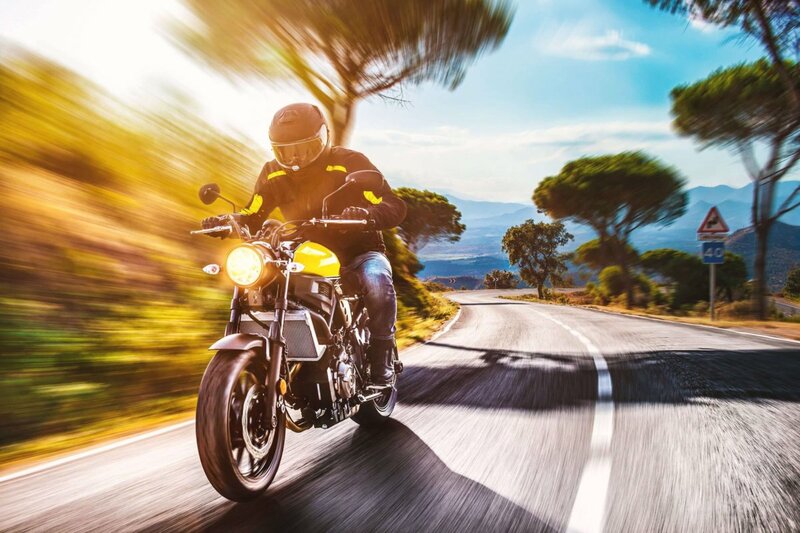 Motorcycle driving can be risky without the proper preparations, so in addition to protecting yourself and your vehicle with Motorcycle Insurance, be sure that you’re familiar with these safety tips. Be sure to wear all the suggested protective gear and clothing that is known to the help prevent injuries in the event of an accident. Do not underestimate the value that these items provide their riders. Wearing the appreciate gear could make all the difference if you were to be in an accident. Leather clothing, nonskid boots, a helmet, and gloves can all protect your body from severe injuries. In addition, you may want to attach reflective tape to your clothing to make you more visible to other drivers. A motorcyclist should never just assume that a driver sees them. Almost two-thirds of all motorcycle accidents are caused by a driver violating a rider’s right of way. Always ride with your headlights on and be certain that you stay out of other drivers’ blind spots. Signaling way in advance for any direction change can help out tremendously. Remember to stay clear of turning vehicles. Every motorcycle driver is required to complete a formal riding education program. Get licensed before ever driving a motorcycle, and take riding courses from time to time to stay up on riding techniques and remain sharpen on strategies that could assist you on street-riding. You should be 100% certain that your motorcycle is fit for the road and in prime condition. If you notice that something seems to be wrong with your motorcycle, it would be highly beneficial for you to promptly figure out what is wrong with it before taking it for a ride, no matter the distance. Check for any cracks, bulges, or signs of wear in the treads of your tires. Low tire pressure or defects could result in a blowout. Regularly look for oil or gas leak signs under you motorcycle. Test for high and low beams of your headlight, taillight, and signals. Be sure that all lights are functioning properly. Other vehicles should be able to clearly know your next moves. The hydraulic and coolant fluid levels should be checked at least once a week.